Don Schmitt's first public appearance since the Roswell Slides debacle and his apology for his role in it proceeded as scheduled, according to John Ventre of the Mutual UFO Network. Schmitt had been scheduled to speak at the May 16 Erie UFO Conference, backed by MUFON. "Yes, Don spoke," Ventre, the state director of MUFON PA, replied in a May 18 email to a query about whether or not Schmitt appeared at the event. "He felt the need to explain the Roswell slide incident but the audience told him they weren’t too concerned with what happened and to just present the Roswell story. They appreciated his wanting to clear the air though." An email was also sent to Don Schmitt offering him an opportunity to comment on the circumstances. He did not immediately respond. Critics will no doubt question the value of research Schmitt and his slides colleagues have to offer, given their latest errors that, if their sincerity is to be believed, demonstrate them at best to be extremely biased investigators lacking objectivity and sound judgment. Some will feel it reasonable to be very skeptical of any information members of the slides team present, particularly more assertions absent conclusive verification. Meanwhile, beWITNESS promoter Jaime Maussan continued to champion the mummy depicted in the slides as an extraterrestrial being, recently taking to Twitter to offer a $10,000 reward to anyone who can produce the body. Outrage has been expressed about such actions and his ongoing rejection of the translation of the placard. He and the slide promoters have also been criticized for their general failure to address the numerous aspects of evidence that were promised to be revealed - but never presented - at the May 5 event in Mexico City. Ofrezco 5 mil dólares de recompensa a la persona que presente una nueva imagen del Ser de Bewitness y 10 Mil a quien presente el Cuerpo. His latest in a long line of grandstanding will no doubt fuel more animosity towards him, Adam Dew and Tom Carey, who continue to refuse to acknowledge the validity of the conclusive evidence published by the Roswell Slides Research Group which shattered their unsupported claims and arguably called motives into question. 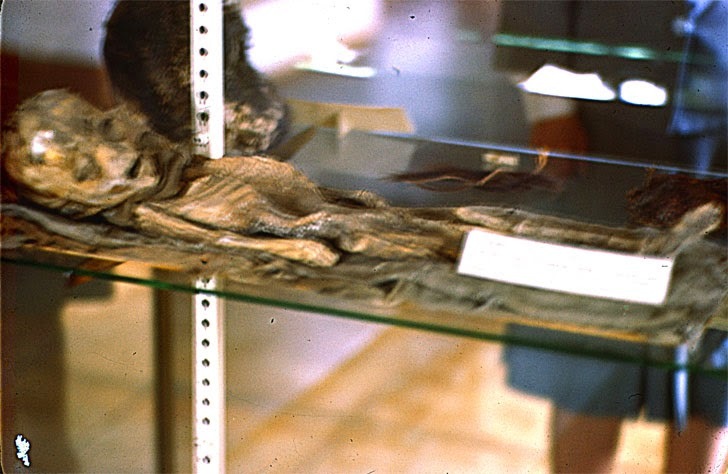 The skeptical group's findings were independently verified by multiple sources, including Frank Warren at 'The UFO Chronicles', who reported a lack of investigative cooperation from Adam Dew and Tom Carey in addition to confirmation the placard identified the corpse as a mummy. Richard Dolan appeared at the beWITNESS event, called the slides compelling and repeatedly vouched for the sincerity and research skills of the slides promoters. In the aftermath of the wheels coming off, Dolan emphatically stated the saga is over for him and suggested the community move on. While some UFO enthusiasts might choose to support Dolan's stance on the matter, others will question how a researcher such as he, that claims to be qualified to report on some of the most intricate and secret aspects of the global intelligence community, could have failed to accurately assess the slides fiasco as absurd from the start. Essentially, an argument could be made that it doesn't make much sense that Dolan couldn't figure out what virtually everyone else in ufology could surmise about the situation and the parties involved. Others, however, will likely not care, as long as they continue to get what they want from so-called ufologists, whatever that may be. For them and the ufologists, perhaps the show must simply go on. "His talk was very good," Ventre concluded about Schmitt's May 16 appearance. Dr. D. Ellen K. Tarr of Project Core has posted a worthy commentary on methodologies employed by FREE (The Foundation for Research into Extraterrestrial Encounters), particularly concerning the group's statements about surveys it conducted. Her article, 'Commentary on the FREE Experiencer Research Study Preliminary Findings', was posted at her fellow Core team member Jeff Ritzmann's Paranormal Waypoint. Dr. Tarr considered the manners the FREE survey questions were constructed, as well as what keeps such efforts from being scientific, in spite of the frequent assertions they are just that. The immunologist also offered some suggestions about what researchers can do to improve their efforts and subsequent results. Tarr and her Project Core colleague, microbiologist Dr. Tyler Kokjohn, have demonstrated a willingness to participate in ufology and weigh circumstances with an open mind. I interpret that does not mean, however, they will accept work without applying reasonable skepticism or believe every fish story without question. This is a shot of B12 for ufology, in my opinion, and I'd welcome a few follow-up treatments. Project Core was a research initiative spearheaded by Jeff Ritzmann and Jeremy Vaeni. They enrolled the assistance of Kokjohn, Tarr and Dr. Kimbal Cooper in designing, conducting and analyzing surveys related to reported paranormal experiences. Learn more about the Project Core group, its findings and the personal perspectives of its members by listening to the latest episode of Jeremy Vaeni's 'The Experience' podcast on Whitley Strieber's Unknown Country. Additional objective, critical review of methodologies employed during investigation of such reported experiences could include considerations of an article published in January of 2015 by the Association for Psychological Science. 'People Can Be Convinced They Committed a Crime That Never Happened' contained info on a study in which research subjects were surprisingly easily led to construct memories and narrations of events that never actually took place, yet the subjects nonetheless believed to be true. The study concluded that wording of questions was key, as were the manners the questions were presented and explored. "All participants need to generate a richly detailed false memory is three hours in a friendly interview environment, where the interviewer introduces a few wrong details and uses poor memory-retrieval techniques," psychological scientist Julia Shaw reported. The implications to investigators of alleged alien abduction (and most anything else, for that matter) should be obvious enough. My point is that objective, qualified professionals should be consulted for purposes of creating and interpreting surveys, interviewing witnesses and similar investigative activities. Additionally, the resulting narratives and suppositions must be independently corroborated before accepted as indicative of objective reality, particularly when the investigators are biased and/or not trained professionals in the first place. Such poor investigative procedures and resulting unsubstantiated assertions have long plagued ufology. Here's to hoping more people will take note of Ritzmann and Vaeni's efforts to enroll qualified help, and then offer those objective professionals chairs at the table when they're willing to sit down. Dreams and schemes of con men from forgotten days of yore, mostly that and little more. Cast by an avid skeptic who ufologists called a bore. They would take however desperately they hungered to learn more. They would never, ever, ever understand the mystery's core, simply stumped and nothing more. Promoted as an alien found upon the desert floor, to be famous evermore. There were loose ends of the story which I'd wanted to learn more. Indeed inspired my interest in what next might be in store. I wondered if such aspects would be more clear than before, merely this and nothing more. Prodding me to hear a sound I had not heard before. Rapping just across the room upon my office door. Prob'ly just some stray cat scratching at my office door, prob'ly this and nothing more. But a skeptic friend who stopped by to discuss the photo more. Yearning to express about the mess of Roswell lore. Of his thoughts about the questions left unanswered from before. I wondered of the details, perhaps for evermore. The days in which Rich Reynolds blogged of geologists seeking ore? And criminal investigations he later begged us to ignore. A solution linking Lady Ray to con men from before? And yet to be explained of how the slides had all been stored? Of how the Rays made Kodak slides amid security galore? News came via laptop of the saga just explored. That the focus on the placard simply could not be restored. Just as the shadows from my laptop persist upon my floor. As we move on to new highs and lows of what the UFO community will accept as reasonable research methodologies and presentations, let's consider why some of us have become so jaded in our willingness to entertain such proceedings. It's not as if the skepticism is not justified. Richard Doty laid some heavy deception on Paul Bennewitz and Linda Moulton Howe. Alejandro Rojas at Open Minds has a good summary of what the USAF is and is not willing to acknowledge about Doty's actions. Then there's Serpo and the MJ-12. The guys over at Reality Uncovered did some pretty good work on those. They thought Doty was linked to Serpo, and Ryan Dube thought John Alexander may have been involved in the distribution of the MJ-12 docs, particularly after interviewing the colonel. Speaking of Reality Uncovered, Andy Murray and the rest of that crew did a great job getting to the bottom of the "Source A" hoax. Then there was the drone hoax and the great work contributed by various Internet personalities. And there was the story about the UFO crash in the Great Lakes that James Carrion bird dogged but the alleged dive company fell off the face of the earth. And the Casselberry, FL alleged crashed UFO case that I pursued, only to establish that anonymous "witnesses" were misrepresenting the circumstances, including submitting a photo to NUFORC that was actually taken in Texas, not Florida, and not a single first hand witness came forward related to the claims on the radio and Internet about a gov-secured crash site. There's the mid 20th century memos Carrion cited, one that documented FBI agents discussing the likelihood UFOs were intel deceptions and another in which the USAF advised the Bureau that the AF could attach disks together by wire and release them at high altitudes. Carrion has since conclusively demonstrated an element of deception involved in the ghost rocket saga. A 1954 CIA memo suggesting assets in Guatemala fabricate a big UFO story is also interesting. There's Romanek, Hopkins/Cortile and the ET-human hybrids that Barbara Lamb claims to know but fails to facilitate documentation of their physical conditions. I'd go as far as to confidently suggest abduction cases in which the "investigators" and interested parties exaggerate and misrepresent the circumstances are the rule, not the exception. There's the iconic photo of the Belgium triangle that apparently wasn't and the corporate UFO hoax perpetrated by a planetarium in Vancouver. And let's not forget the flying saucer that wasn't following Hale-Bopp that involved a bogus photo, an alleged but unnamed astronomer and dubious claims of remote viewing, all propped up on Art Bell's show before being conclusively demonstrated to have been a hoax prior to the Heaven's Gate cult mass suicide. If conclusive IC involvement in such circumstances is of particular interest, learning more about Project Palladium is a must. It was a joint CIA, NSA and DoD operation that involved projecting false radar paints onto radar screens while simultaneously releasing unusual aerial objects into the paths of what were referred to as the ghost aircraft. Some operations apparently shared many characteristics of rather typically reported UFO sightings by military pilots, including losing radar contact at the point in which the pilot was preparing to fire upon the bogie. There are lots of hoaxes and deceptions that are interesting and relevant, and the above are just a few. Learn more by searching this blog or, of course, the Internet. There is no shortage of UFO hoaxes and obfuscation, both with and without the intel community. Reasonable skepticism and holding self-proclaimed investigators to high standards when presenting alleged evidence are more than justified.